Upon arrival at the galvanizing plant the steelwork is inspected to ensure its suitability for hot dip galvanizing. Any issues identified such as missing venting holes or paint on steelwork are communicated to the customer and options to remedy are discussed. The steelwork is then dipped into a tank of dilute hydrochloric acid. This ‘pickling’ process removes rust and mill scale so that all surfaces are perfectly clean ready for the galvanizing process. After pickling, the steelwork is submerged into a tank of water to wash away the acid. The final pre-treatment dip is 30% zinc ammonium chloride. This process helps remove any remaining traces of oxide from the steelwork and enables the galvanizing process to occur. Moisture and molten zinc do not mix very well so before galvanizing we store the steelwork in our dryer until it is safe to dip. The steelwork is submerged into a bath of molten zinc. The actual time the steel remains dipped is usually only 10 minutes or so. This is just long enough for the reaction between the steel and the zinc to take place. We do not call it HOT dip galvanizing for nothing. The zinc is kept molten at 450oC and therefore the steel takes a little time to cool after dipping. After cooling, the steelwork is inspected to ensure it is galvanized to the British Standard BS EN ISO 1461 (2009) and is then weighed and packed ready for despatch. 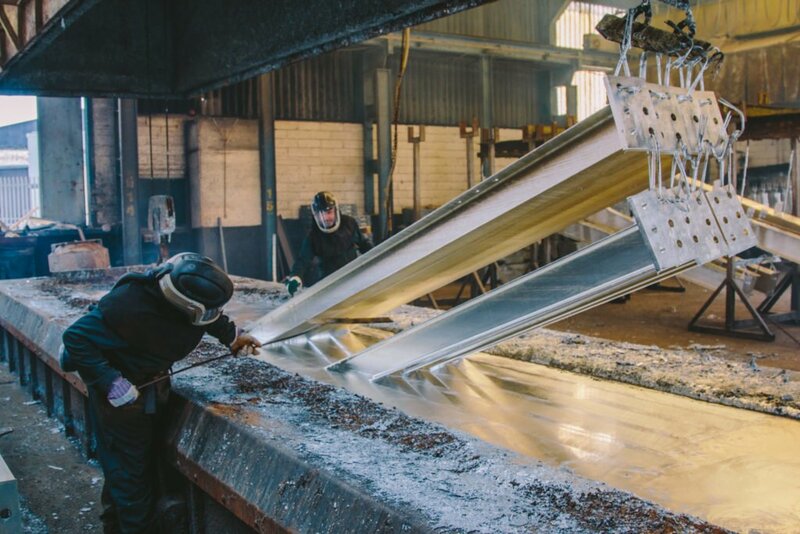 After galvanizing, our Shropshire plant dip the still hot steelwork into a passivation bath. This chromate solution cools the steelwork faster and protects the zinc shine for much longer than if the steelwork was simply left to cool naturally.